Individual Events (IEs) are an educational program that offers Thespians the opportunity to receive constructive feedback on prepared theatrical material and technical designs. The performance Individual Events include: monologue, duet acting, group acting, solo musical theatre, duet musical theatre, and group musical theatre. The technical Individual Events include: costume construction, costume design, lighting design, scenic design, short film, sound design, stage management, and theatre marketing. Each year the National Individual Events program culminates in the National Individual Events Judges' Showcase at the International Thespian Festival in Lincoln, Nebraska. 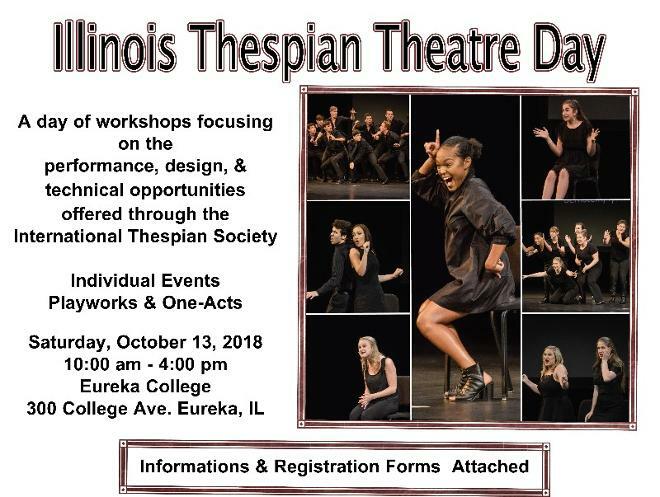 Illinois will host an Illinois IE Theatre Day, November 4, 2017. If you are interested, please click on the link for more information.